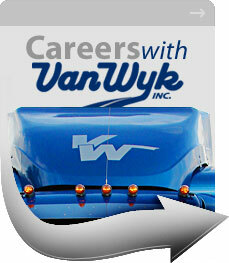 Welcome to the Van Wyk, Inc. website. Van Wyk, Inc. is a family owned corporation, which specializes in the time sensitive transportation of fresh and frozen foods and other specialized products in truckload quantities. In 2018, the company celebrated it's 60th year in business. It is headquartered in Sheldon, Iowa, which is located in the northwest corner of Iowa just 35 miles south of I-90. Although our home office is located in Sheldon, IA we have satellite offices located in Waynesboro, VA and as of the fall of 2007, Great Bend, KS. Our brokerage division, known as VTS, Inc is located in Fairmont, MN. The traffic lanes we service primarily consist of the eastern half of the United States, the Pacific Northwest and parts of Canada. We presently operate 215 plus power units and 340 late model, temperature controlled, air-ride reefers. Van Wyk, Inc. has a longstanding reputation of honest and upfront dealings with our customers, suppliers and workforce. We have worked hard through the years to create a transportation company that has a great reputation, an outstanding safety record and meets the needs of the most demanding service requirements. Whether you are looking at our site as a prospective team member in a trucking career, a new or existing customer, or just familiarizing yourself with our company, we hope you find our site to be easy to use and informative. Thanks for allowing us the opportunity to share a little about our company.